SAN LEANDRO//HEALTH CARE | Sutter Health and the Alameda Health System are set to sign a letter of intent to begin negotiation terms of an agreement that will keep San Leandro Hospital open for, at least, the next two years. Under the proposed deal, Alameda Health System (AHS), formerly known as the Alameda County Medical Center, would gain title to the entire facility, estimated to be worth between $30-40 million, along with a one-year subsidy from Sutter in the neighborhood of $18-20 million, said Alameda County Supervisor Wilma Chan. Sutter, would, in essence, wipe its hands clear of San Leandro Hospital, which would maintain emergency room services, in addition, to remodeling its vacant fourth floor with up to 30 beds set aside for acute rehabilitation services. Sutter would also walk away from an operation it estimates is bleeding monthly losses of $2 million. Under the proposed terms of the non-binding letter of intent, which will run through July 1, Chan said, there is no covenant for how AHS will run San Leandro Hospital in its current configuration, nor how long. If a deal is struck the facility could be turned over to AHS as early as this October, said Chan. The proposal is similar to one that broke down earlier this year calling for the county, city of San Leandro and Eden Township Healthcare District to each contribute a 3-year/$3 million subsidy to cover the hospital’s operations under AHS. That framework is also part of this deal, said Chan. The Eden Township Healthcare District, though, balked at the terms of the previous deal and charged Chan was deliberately threatening the body with dissolution. After losing San Leandro Hospital in a lengthy legal case to Sutter, the District no longer possesses a hospital to oversee. Those terms appear to be again on the table for the District. Part of the deal involves asking the health care district to contribute a one-time $20 million subsidy to cover the hospital’s second year of operations. The District’s Board of Directors meets for their monthly meeting on Wednesday. Alex Briscoe, the director of Alameda County Healthcare Services, says the deal on the table today is nearly identical to those discussed in 2009 when Sutter first announced its intention to close the hospital and turned it over the Alameda County Medical Center for acute rehab services. Those beds were lost with the closure of nearby Fairmont Hospital, which the county deemed too costly to undergo seismic upgrading. 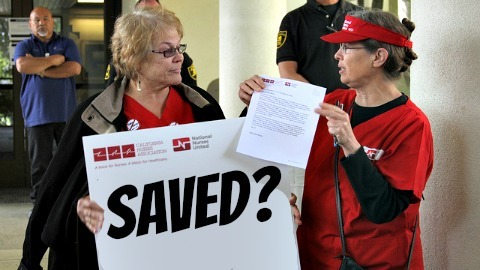 One key difference this time around may be Chan’s decision in April to withhold a nearly $2 million county subsidy earmarked for Sutter’s rebuilt Castro Valley Medical Center for trauma services. The subsidy is matched by federal funding doubling its value to Sutter. Chan pulled the item from the board’s consent agenda in what now appears to be a move to leverage the trauma subsidy against Sutter. Under terms of the letter intent, said Briscoe, the county would release the trauma funding to Sutter by May 21. Posted in Alameda County Board, Alameda County Health Services, Alameda County Medical Center, Alex Briscoe, Eden Township, health care, S.L. Hospital, san leandro, subsidy, Sutter, Wilma Chan. Bookmark the permalink. How about, once again Tony Santos is right and Papa a**hole is just a reactive jerk afraid for his job and fueled by misplaced admiration for the loudest advocate in the room. Oh, and nothing in this deal says that the Eden District is going to duck liability for damages. Anon 7:18's memory is poor. Or perhaps it's their reading comprehension. Perhaps both. Here's the facts for the strange people like Anon: this deal to discuss terms which would have the County own the property and building and keep the Hospital's ER and Acute Care services open is a breakthrough. For the first time, it would officially move both Sutter and Alameda Health Services off of their previously held position, which would have only leased the Hospital property to the County under terms which would have prevented AHS from providing an ER, ICU and other Acute services to the community. Sure, back when Mayor Santos was undermining the Healthcare District by spouting Sutter Health talking points, he talked about a deal which would have created a hybrid set of health services with an ER. What drove so many of us crazy about Tony's patronizing drivel back then was that he was behaving as if Sutter was prepared to make that deal back then. In fact, Sutter was completely intransigent and unwilling to accept that deal in 2009 and 2010. Hell, even the County was unwilling to move off the must-close-ER deal they had made with Sutter. So, those who are true supporters of health care to the community are very pleased that Sutter and the County appear prepared to come to the plate to finish a deal which would create the outcome the people have been asking for, the outcome the community needs. Jon is right anon is wrong. If this is the same deal as 2009, then why is Sutter dealing now? Do you mean to tell me all this heartache was a big waste of time, money and energy just so Sutter could bled a community dry? Screw Sutter! I've read other articles says Sutter is “donating” SLH. Tavares portrays it as financial transaction. Bravo, Steve! That what this is, a big tax break for Sutter. No reason to make Sutter look like a champ, when everybody knows they're a chump. SLH is a losing proposition. The county will close it eventually or transform it into a rehab hospital. Sutter has won, the ETHD should be closed and assets to SLH. San Leandro Hospital loses $24mm a year, Sutter is giving $22mm. Where does the $2mm to run it first year come from and the where does the $24mm come from in the upcoming years? Chan was a Supervisor before she was a state legislature and she always cared about health care issues above all else. She's the best Sup. we have right now and without her intervention we would have lost the emergency room already. This means there would have been many more deaths in our area as people drove the extra minutes to already overcrowded other emergency rooms. Thank you Wilma for you have done. Hands down this site has the best coverage of this issue eanywhere. Since day one. Anon May 16th 10:36 is a bit vile in their argumentation, and lacking comprehension in their reading. While Briscoe did say a similar hybrid services deal was discussed in 2009, did Sutter sign a letter of intent in 2009? No. No, they did not. That's the problem with those who wish to bring us false history here. People wanted Sutter to accept this deal back in '09, but Sutter was fixed on a more total “victory” in these negotiations. Perversely, in Sutter's view “victory” would have been the permanent closure of the ER and other acute care services, which would likely have killed many hundreds of people and would definitely have increased the suffering of many thousands. It has been fascinating to read the sociopathic statements of so many on these comments threads who demand closure of SLH's irreplaceable health services because of business concerns. These people also wish to believe that Sutter's $20+ million reported annual SLH operating losses are reflective of a Hospital which has been run in good faith. It has been well reported that Sutter has systematically pulled many lucrative services away from SLH, sending many of them to their other hospitals in the region. It is also undeniable that SLH never ran at such large deficits under previous managements. the previous owner triad health was making money hand over fist. they let SLH because they were no longer interested in taking stake in California healthcare and competing with dominant kaiser and sutter. Triad lost money during their ownership of San Leandro Hospital, but they didn't lose $20 million a year, which is what Sutter is claiming as their losses. Triad also sold a viable business to the Eden Township Healthcare District in 2004. The District Board chose to lease SLH operations to Sutter, which was too bad for both the District and its citizens, since Sutter intentionally ran the hospital so poorly that they claimed even before their 3-year lease was done that the Hospital was no longer a viable business. They lied, of course. To repeat (it seems that we must repeat this over and over again): No one is claiming that Alameda County will be able to run the hospital at a profit. However, there is plenty of reason to be confident that in the near future, after AHS has repaired the damage Sutter did to the SLH business model, the Hospital will come closer to break-even. It is worthwhile for us to spend public money to maintain hospital services which save thousands of lives per year and eases suffering and increases convenient health care access for tens of thousands more every year. Only the worst people on Earth would disagree with that.